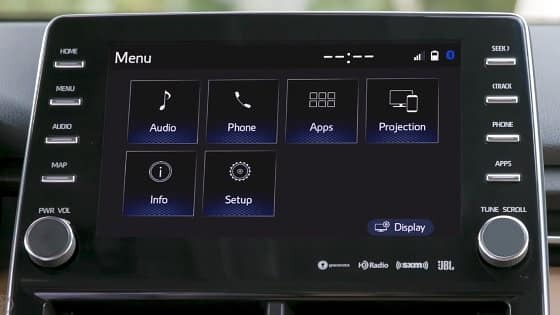 EntuneTM is a revolutionary in-car technology that keeps you and your Toyota connected. Featuring a collection of popular mobile apps and data services, the available EntuneTM packages allow you to access a wide variety of personalized content and services – all from the comfort of your Toyota vehicle. iPod® /USB 2.0 /AUX: May not be compatible with all mobile phones, MP3/WMA players, etc. Bluetooth® /Music Streaming: When the EntuneTM system is paired with a compatible MP3/WMA-capable smartphone, you can listen to your playlists through your Toyota’s sound system. Hands Free Calling: When the EntuneTM system is paired with a compatible Bluetooth® phone, you can make hands-free phone calls. Voice Recognition: Voice recognition helps you find your favorite spots, while staying focused on your drive. You can program and store your favorite destinations, and save previously searched for locations automatically. Siri® Eyes Free: When the EntuneTM system is paired with a compatible iPhone® you can perform Siri® commands in your car without ever looking down at your phone. HD RadioTM Technology: 100% subscription-free digital radio available in most 2016 Toyota vehicles with more channels and variety in crystal-clear digital sound. HD2/HD3 Stations: 100% subscription-free with more than 2,100 HD RadioTM stations nationwide. These stations have also added over 1,700 new HD2/HD3 channels to their local markets, giving you more variety on your FM dial. HD Traffic and Weather: 100% subscription-free HD RadioTM Traffic keeps you informed on the road displaying current and in-depth traffic flow and travel conditions, allowing you to find a quicker route. HD RadioTM Weather gives you real-time weather forecasts. Scout® GPS: With manual, voice or programmed destination search, the available Scout® navigation app finds your location using your smartphone and delivers audio and on-screen turn-by-turn directions of up to three routes to choose from with estimated time of arrival based on current traffic. 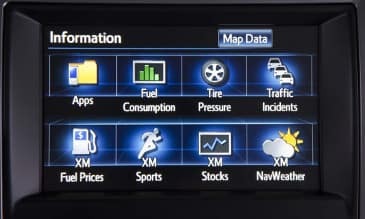 Integrated Navigation: The available EntuneTM Premium system with Integrated Navigation and App Suite has an easy-to-read navigation display providing clearly marked directions with real-time traffic updates. These services are delivered via most smartphones and some feature phones using Bluetooth wireless technology and a cellular data connection.